Click on the link below to see where I got this picture from. On Friday a gigantic, 8.9 magnitude earthquake hit Japan. It triggered a tsunami which caused lots of the destruction. Thousands of people are dead and others are homeless. Houses, cars, and boats are distributed everywhere like toys. The scene in Japan is absolutely horrific. Because Japan always has lots of quakes,their buildings are built to withstand the regular tremors. The epi-centre was just off the coast of Japan. But it wasn’t the earthquake that did lots of the damage. 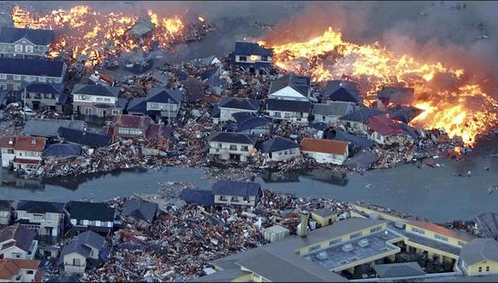 The earthquake caused a massive tsunami. Everything in it’s path was destroyed by the surging waves. A huge, 10 metre wall of water crashed over Japan, leaving it destroyed and engulfed by water. Debris floated on the surface and was carried out to sea. Like everyone else I hope that Japan will recover from this disaster. What's the Difference Between Sharks & Dolphins? Day 1 of Camp: Swimarama!